Amazing GOOP RV is the only adhesive and sealant needed for inside and outside RV use because it repairs, seals and sticks to a wide variety of materials with superior strength. 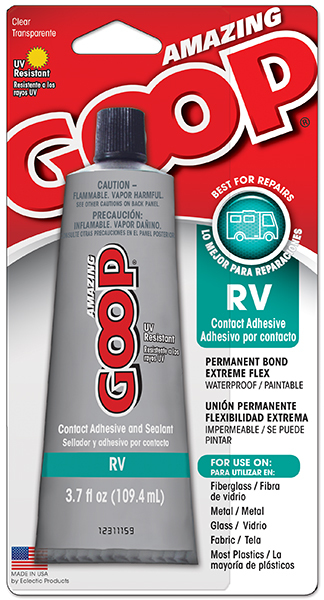 Weatherproof and UV resistant, Amazing GOOP RV can be used as an adhesive and as a sealant. It’s ideal for stopping leaks in windows, shower drains and vents. It creates a flexible hold that will not crack or break under stress such as road vibrations. Repairs tears in rubber roofs, awnings, vinyl floors and permanently adheres moldings and reflectors.